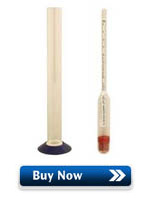 A hydrometer is used to measure the density of liquids. The denser the liquid, the higher it floats. Sugar is denser than water or alcohol so in brewing we use a hydrometer to measure the amount of sugar in wort and beer. The standard measure of density we use is called 'specific gravity' (SG). Specific gravity is measured at several points during the brewing process: During sparging, before the wort is boiled, after the wort is boiled, before fermentation, and after fermentation (to name a few). The gravity of the wort before fermentation is called the 'original gravity' (OG) and the gravity of the beer after fermentation is called the 'final gravity' (FG). The difference between the two is used to calculate the alcohol content of the beer. Distilled water has a specific gravity of 1.000. A typical 5% ABV (alcohol by volume) beer usually starts as wort with an original gravity of around 1.045 - 1.050 and finishes fermentation at around 1.007 - 1.012. 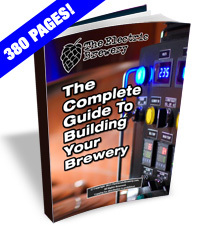 The larger the difference between the starting and ending gravities, the higher the alcohol content of the beer and the lower the final gravity, the dryer the beer. We use a hydrometer that reads from 0.990 to 1.170. The range is large enough to cover any beer (or wine for that matter) that we'd ever think of making. A hydrometer test jar is also needed in order to float the hydrometer in the liquid sample. For greater accuracy, smaller range hydrometers are also available such as a final gravity hydrometer, meant for taking readings in only the 0.990 to 1.020 range. Interested in real time / automated gravity measurement while fermenting? Consider The Beer Bug. Hydrometers are factory calibrated to be used at only one specific temperature, usually 60F or 68F. The value is printed on the piece of paper found inside as show in the picture below. Specific gravity drops when the temperature of the liquid increases. 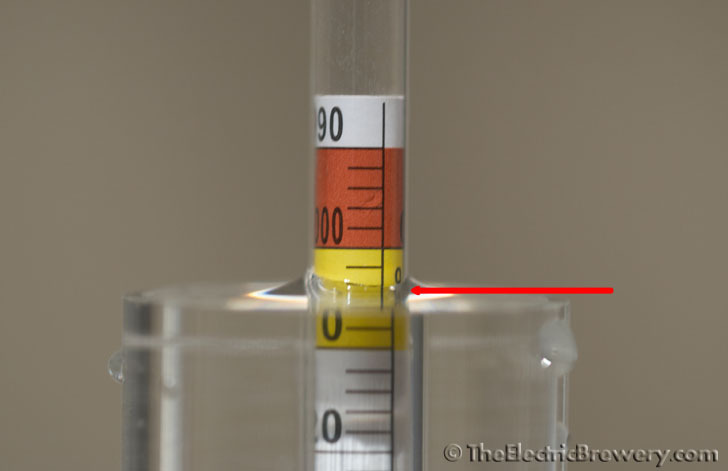 If you take a reading that is not within a few degrees of the required temperature of your hydrometer, make sure to convert the gravity in order to give the true reading. The brewing software we use (BeerTools Pro) includes a handy calculator to convert the specific gravity from one temperature to another as shown below. 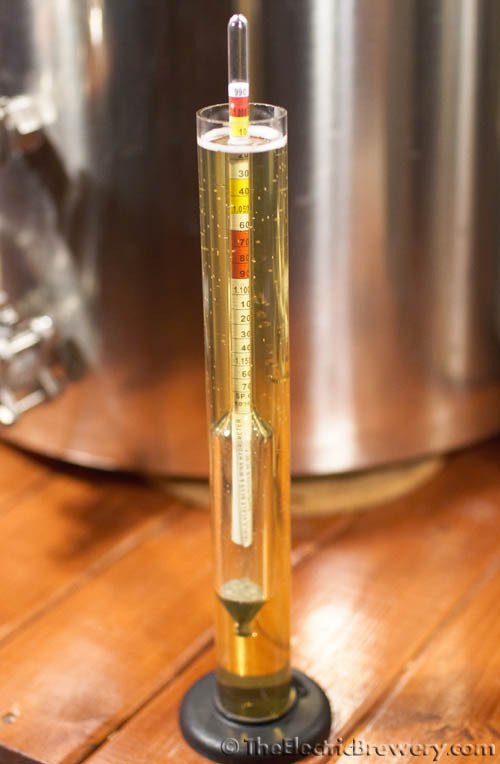 In the example above, we see that a reading of 1.007 taken at 68F actually results in a specific gravity of 1.008 once we correct for the fact that our hydrometer is meant to be used at 60F. Using a calculator is considerably quicker and easier than trying to heat or cool a sample to the correct hydrometer calibration temperature. While not compensating for temperature is the most common source of error when using a hydrometer, another is assuming that the hydrometer is accurate to begin with. Many unfortunately are not. All hydrometers should therefore be calibrated before they are used for the first time. Banging or dropping a hydrometer may cause the paper inside to slide, also requiring a recalibration. The hydrometer itself is not altered during the calibration. Instead, we measure liquids with known gravities and confirm that our hydrometer is working correctly. If not, we can calculate the offset required to ensure accurate readings. Fill the hydrometer test jar with distilled or reverse osmosis water. Do not use tap water as it may contain impurities. Float the hydrometer in the test jar and cool to the hydrometer calibration temperature (60F in our case) by placing it in the fridge. A calibrated temperature probe must be used to measure the temperature, otherwise errors may be introduced. We use our ThermoWorks ThermaPen. Once the hydrometer calibration temperature is reached, spin the hydrometer to dislodge any bubbles that may be clinging to it, and note the reading. If your hydrometer is accurate it will measure 1.000. With most hydrometers, the reading is taken where the water is at its lowest point (called the meniscus) and not the highest point where the water touches the hydrometer. When in doubt, confirm this with the instructions that were provided with your hydrometer. In the picture below our hydrometer reads 2 notches below the 1.000 line, resulting in a reading of 1.004 (each notch is 2 points). Our hydrometer therefore reads 4 points too high at 1.000 and we know that we need to remove 4 points from the reading. This is a fairly significant error. This single point calibration only ensures that we can take accurate readings near 1.000 as we know the error that is introduced at this point only. To ensure that the hydrometer scale printed on the paper inside is not compressed or stretched, we must take a second reading and extrapolate. To do this dissolve 24 g of table sugar (sucrose) in 176 g of distilled (or reverse osmosis) water to produce a solution with gravity of 1.048. A calibrated scale is required to weigh the sugar and water, otherwise errors may be introduced. We use the same precision jewelery scale that we use for salt additions. Float the hydrometer in the solution, cool everything to the hydrometer calibration temperature, and take a second reading. 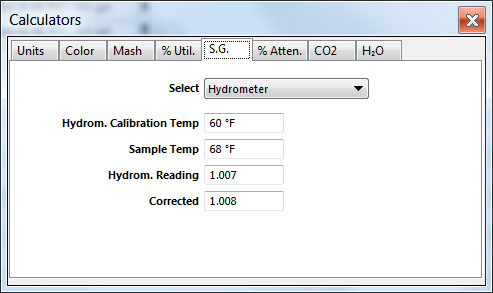 If your hydrometer introduces the same error as in the first step then you may stop here. Apply this offset to all readings from now on to correct for your inaccurate hydrometer. For example, our hydrometer also reads 4 points too high at 1.048 so we know we must always take 4 points off any reading for accurate results. If your hydrometer read exactly 1.000 in the first step and exactly 1.048 in the second step, your hydrometer is likely accurate across the scale and no offsets are required when taking measurements. 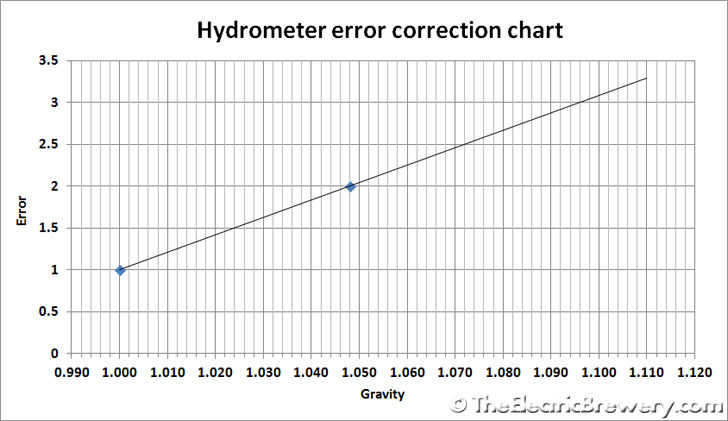 If your hydrometer has different correction offsets at 1.000 and 1.048 then the correction will vary based on the gravity. The easiest way to calculate the correction is to graph the errors at 1.000 and 1.048 and use a straight line to extrapolate. For example, if the hydrometer measures 1 point too high at 1.000 and 2 points too high at 1.048, your graph would appear as shown below. You may download our Excel Hydrometer Error Correction Chart and plug in your two numbers to create your own correction chart. If you're feeling adventurous, double up the amount of sugar and make a 1.096 gravity solution and graph a third point for even greater accuracy. The more data points, the better. Always remember to compensate for both temperature and inaccuracies when using a hydrometer. For example, our hydrometer is calibrated to 60F and reads 4 points too high across the board. If we take a reading that measures 1.012 at 70F we must lower the reading to 1.008 to compensate for the 4 point inaccuracy, and then convert from 70F to 60F which raises the gravity reading by one point to 1.009. 1.009 is now our correct gravity reading of our 70F sample, even though our hydrometer shows 1.012. The order in which you compensate (temperature before inaccuracy or vice versa) does not matter. 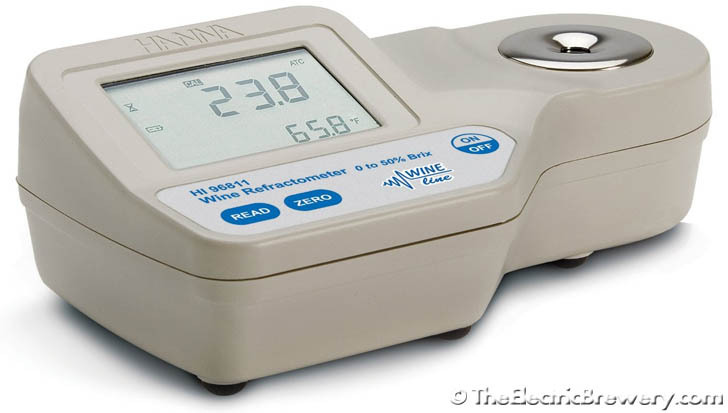 While we still use this same hydrometer we've owned for 20+ years now, we have to point out the measuring tool that we'd like to own (eventually): The Hanna 96811 refractometer. It is waterproof, rugged, and only requires a few drops to take a reading and returns results in about 1.5 seconds. The best part is that unlike hydrometers, it includes automatic temperature compensation (ATC) and can be calibrated. You don't have to use calculators or charts to convert the results when taking original gravity readings. Similar to manual refractometers however, once any alcohol is present (any time after fermentation has started), a calculator such as this one must be used to correctly measure gravity. Looking for something a bit more portable? 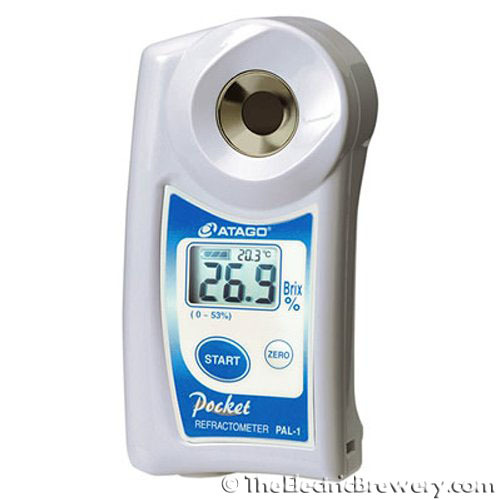 The Atago PAL-1 Digital Hand-Held Pocket Refractometer gets great reviews from brewers. Completely waterproof (it even floats), includes ATC and is simple to use with only two buttons: Take a reading or calibrate.